Since we started living partly in France, we’ve noticed that the French do love their outdoor events. Blessed with a more consistent climate than the UK, during the summer there’s a constant stream of music festivals, car shows, evening markets and even a local beer festival, as well as date specific celebrations such as the 14th July. There’s also a fair sprinkling of horse shows – but don’t expect British-style gymkhanas. These shows are spectator only, and feature ‘le voltige’ (acrobatics such as dismounting and mounting at a gallop), carriage driving displays and processions. We recently attended an evening event at the beautiful Abbaye de Bonnefont, a building that can trace its origins back to the 12th century. The garden courtyard plays host to a number of events, including an evening of live music with a light show projected onto the abbey wall. 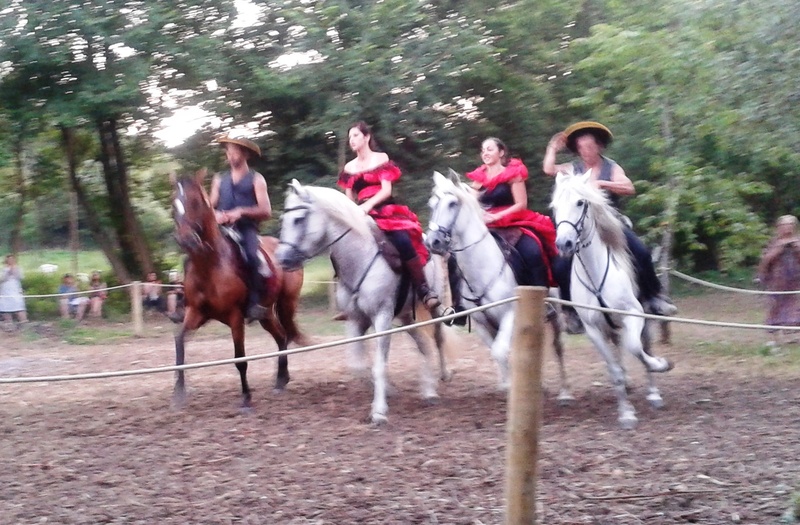 We were there, though, for Follement Cheval, a two day event in celebration of the horse. This year’s event was Spanish themed, and boasted tapas and As it was so hot, we’d opted to attend only the final evening. 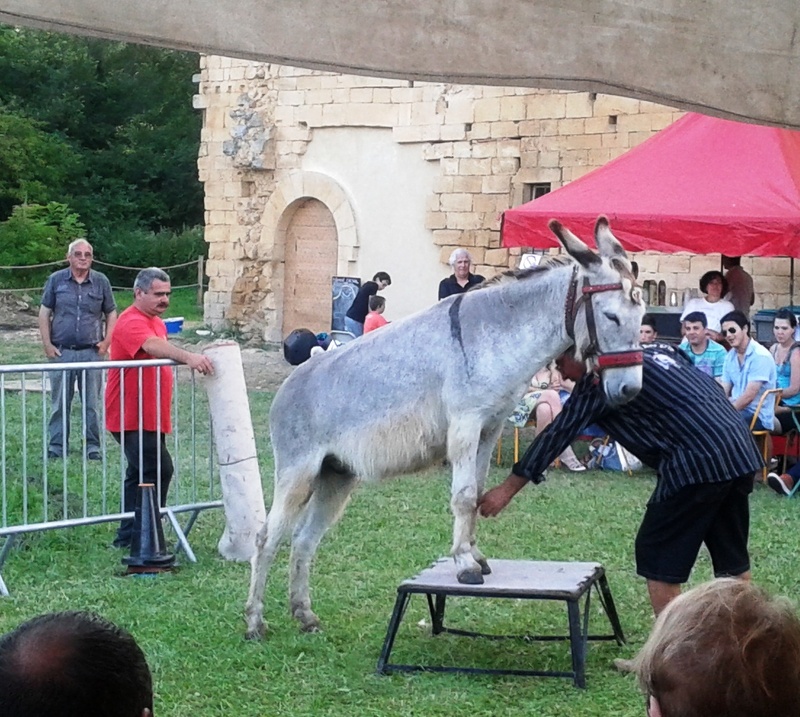 After the traditional late start, which we’re now becoming used to, the event finally kicked off at 8.30pm with a display by René Grassi of the Mas de l’âne gris, presenting his donkeys in a ‘spectacle asin’. Although designed to be a series of stunts and tricks performed by the four donkeys, bored with the long wait they obviously decided to take matters into their own hooves and stage a strike. Poor René became increasingly desperate as his donkey refused to unroll a carpet, put its head through a hoop or knock over a row of coloured cones, choosing instead to roll its eyes superciliously and crop grass. Eventually, the pleading René managed to persuade his errant charges to stand on a block, and grudgingly count to 10. Which just does to show, you really can’t make a donkey do something it doesn’t want to do. Afterwards, as the soft twilight came rolling down the valley, the audience of forty or so stood up and walked the few hundred yards to the arena, where the main attraction would perform. 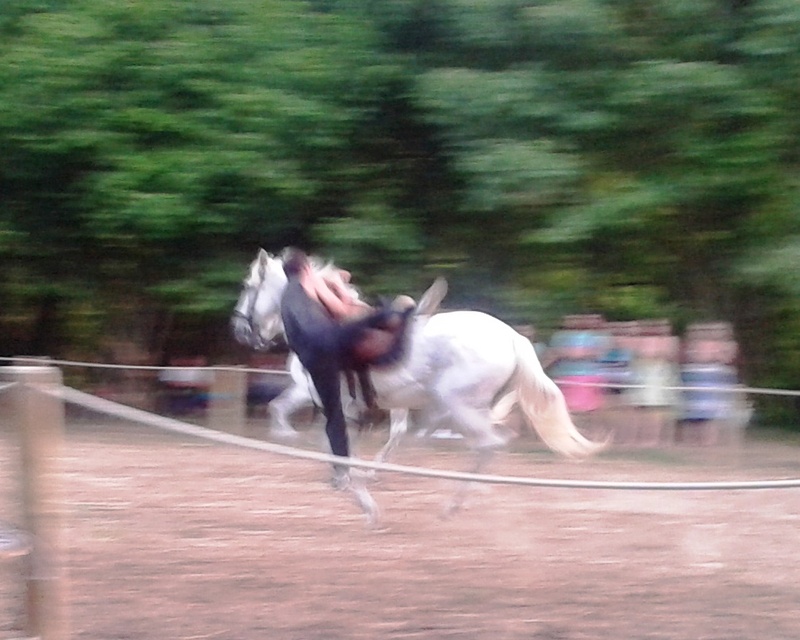 Up tempo Spanish music burst from the loudspeakers, and two riders on stunning Andalusian horses galloped into the ring, coming to dramatic sliding stops. The two then performed a series of stunts, which the commentator incongruously assured us were ‘cossack style’, flinging themselves nonchalantly between their horses and the ground. 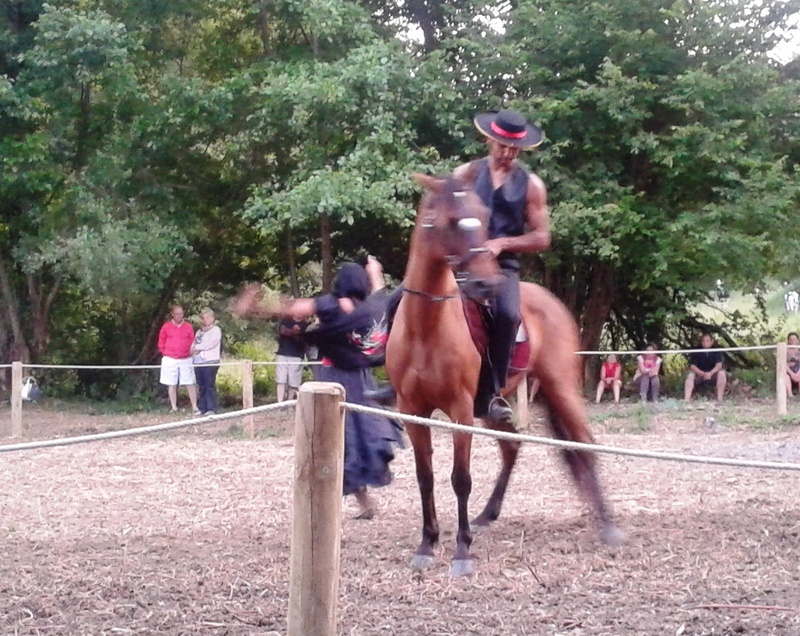 Next was a display of Spanish dancing – a single dancer twirled and pirouetted around a stunning bay Andalusian, appropriately asked by his rider to perform a Spanish walk. After more displays of groundwork and ridden dressage, all four riders plunged into the ring together – the two men and two girls all in traditional costume for a formal display of drill riding. Finally, with the night closing around us and the midges starting to bite, we packed up to leave, and I couldn’t help thinking that the setting and intimacy of the event made it feel slightly surreal. 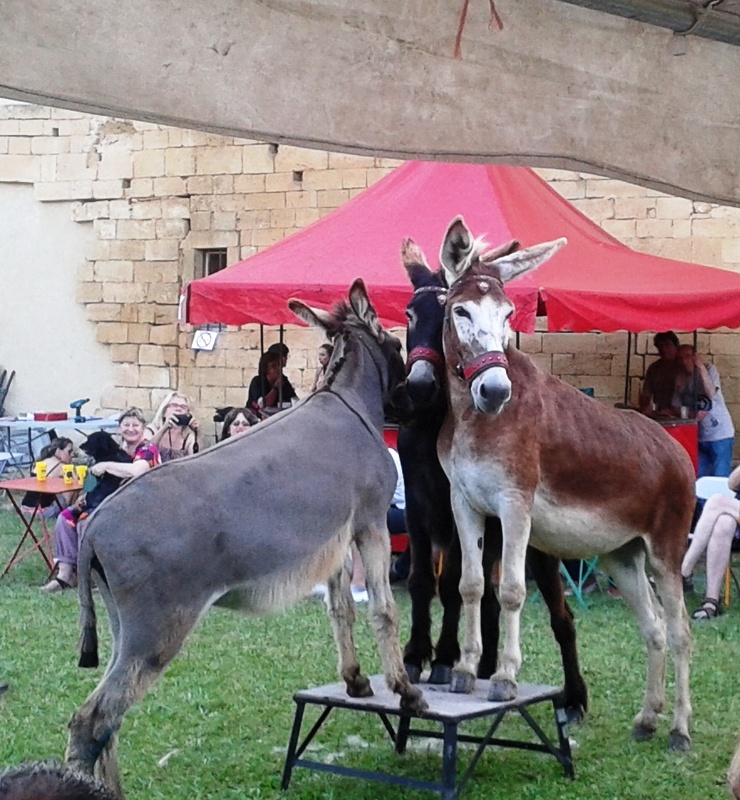 The cheerful chaos that had surrounded the performance – spare donkeys grazing happily amongst the crowd, small children helping with the barbecue – added to, rather than detracted from the atmosphere. If you’re ever in France in the summer and see a small, modest, printed note advertising one of these events, go – but be prepared to ‘vive la différence’.